Bharatanatyam is a classical Indian dance form that is popular and nurtured in the Indian state of Tamil Nadu.This dance form denotes various 19th and 20th century reconstructions of Sadir, the art of temple dancers called Devadasis. Sadir in turn, is derived from ancient dance in the treatise Natya Shastra by Bharata of fourth or third century BCE. A possible origin of the name is from Bharata Muni, who wrote the Natya Shastra to which Bharathanatyam owes many of its ideas. This etymology also holds up to scrutiny better since Bharathanatyam is pronounced with short (kuril) forms of “bha”, “ra” and “tha” whereas each of “bhavam”, “ragam” and “talam” contain the long (nedil) forms. Hence the initialization proposed above is more probably a backronym. Bharatanatyam is a reworked dance-form from the traditional “sadir” known for its grace, purity, tenderness, and sculpturesque poses. Today, it is one of the most popular and widely performed dance styles and is practiced by male and female dancers all over the world. Bharatnatyam is considered to be a fire-dance — the mystic manifestation of the metaphysical element of fire in the human body. It is one of the five major styles (one for each element) that include Odissi (element of water), Kuchipudi (element of earth), Mohiniattam (element of air) and Kathakali (element of sky or ether). 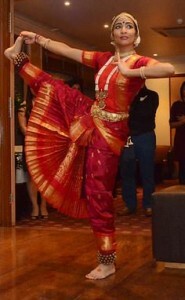 The movements of an authentic Bharatanatyam dancer resemble the movements of a dancing flame. Contemporary Bharatanatyam is rarely practiced as Natya Yoga, a sacred meditational tradition, except by a few orthodox schools (see Yoga and dance). Bharatnatyam is a solo dance, with two aspects, lasya, the graceful feminine lines and movements, and tandava Ananda Thandavam (Tamil) (the dance of Shiva), masculine aspect, which is identical to the Yin and Yang in the Chinese culture. However it is extensively performed as group ensemble and theatre production work.